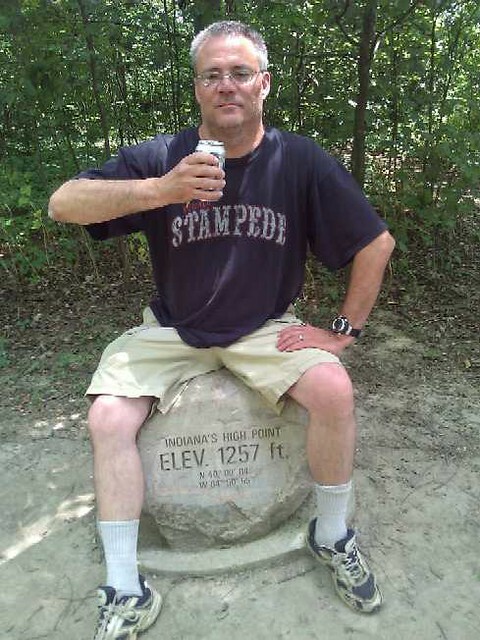 The high point of the State of Indiana sits at 1,257 feet in a very rural area of Franklin Township, Wayne County, approximately 10 miles North of the City of Richmond, Indiana, or 10 miles SSE of the smaller City of Winchester, Indiana, where I was headed on the day of my visit. It's a pretty interesting location, really. There are no "hills" per se, but very slightly rolling farmland, which is obviously higher than any other part of the State. According to Platinum Earthcache Master ARF, this is because the high point is in an upland that is buried under glacial Till. Personally I would have thought it was a plateau, so that is some good information. This whole thing may seem lame to some, but hey, it's about 700 feet higher above sea level than the area I live in, in Western New York State. The high point is located on private property, but the landowner allows visits there as a privilege, not a right. In 2005, an Eagle Scout, and his troop, along with coorperation from the landowner and the Highpoint society, built a trail sign, and a picnic area at the high point. You can read all about this at the Waymarking.com page for the high point under the "Eagle Scout Projects" category. If there is no one else there visiting, you can literally park about 25 feet from the highest point in Indiana, although I personally had to park 150 feet away, with two other parties in the area at the time of my visit. Umm, just kidding. You don't actually need to gag down a can o' Natty Light to log this virtual cache. A pic of you in front of, or sitting on the boulder (and it's easy to sit on and straddle), is fine. The high point is a Waymark (in 3 different categories) and Earthcache on the Groundspeak side, and there is also a .50 cal ammo box Geocaching.com cache about 200 feet from the high point in the woods. From looking at the image gallery and reading the logs of the Earthcache, I believe the engraved boulder that will be used for this virtual was installed in early July 2011. The high point of Indiana is being improved all the time. It defintely is a nice little area for a visit. P.S. my socks are hiked up in both pics because I found the .50 cal ammo box in the woods first. I don't normally roll like that. Really. A blurry pic taken with my phone by a well meaning vistor. Yuck, Yuck Jr., and nephew of Yuck. I'm surprised that no logs have been entered prior to this date! 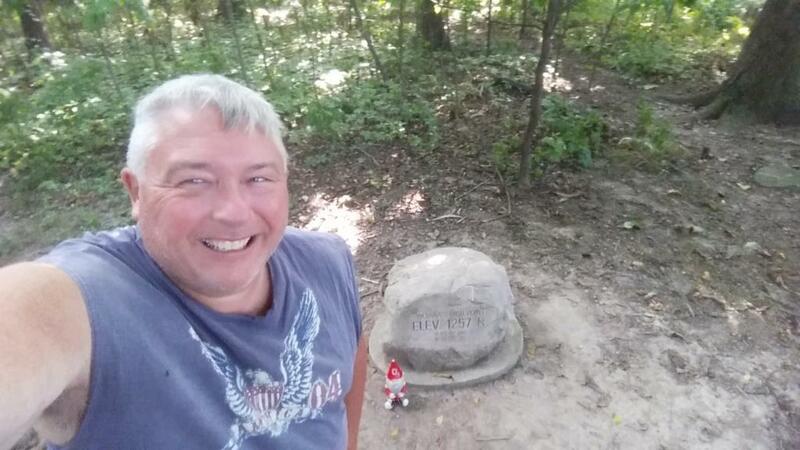 I've been to the High Point several times now, and made a return trip today to grab the geocache just a couple of hundred feet away as well as this Virtual. It was sad to note that the door to the "log box" is now missing---wonder how that happened? Anyhow, Mrs T. and I enjoyed the thin air of the High Point and sat there at the picnic bench for quite awhile soaking in the serenity of the place. Thanks to the CO for another reason to return to this nice place, and to the property owner for allowing visitors to this geo-important spot!